Hong Kil Dong (홍길동) / Hong Gildong (홍길동) - Games - SMS Power! 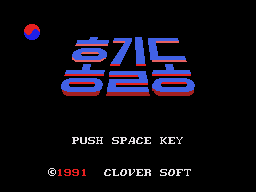 Also see the article by Derboo: http://www.hardcoregaming101.net/korea/part1/company-clover.htm "An autoscrolling run 'n gun based on the traditional Korean story Hong Gildong-jeon. 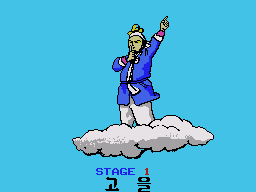 The titular hero has to fight ghosts and demons, on his way to the boss (which he fights after mounting a cloud) in each stage he can also open treasure chests, which contain several powerups. This game offers a good opportunity to take a brief look at the original tale, as it's only the first of many games that are based off or reference it. Hong Gildong is the son of a Yangban, the Korean gentry during the Joseon era (1392 to 1910). Yet he finds himself at the lower end of the caste system because his mother was a mere concubine. So despite being extraordinarily gifted, he has no perspective of social advancement, and isn't even allowed to refer to his father as such. Because he is marked as cursed, his family attempts to have him killed, but he flees and becomes kind of a Korean Robin Hood. At the end of several adventures, he conquers the demon-infested island Yuldo and establishes a nation without social discrimination. The tale is popularly attributed to the 16./17. century scholar Heo Gyun, which is not entirely undisputed among historians of Korean literature. The game has been originally advertised by a company called Saeron System, but at least the Master System version was published by Clover in the end. Who actually developed the game is not known. The game is extremely rare, despite it being a giveaway at magazine raffles for years. " There is a development page for Hong Kil Dong (홍길동) / Hong Gildong (홍길동). Visit it to see technical discussion of this game.